Meeting the benchmarks for social communication skills is a core challenge for children with autism spectrum disorder (ASD). In typical development, young people often learn these skills by observing others in interactions with adults and peers, or through their own interactions. For children on the spectrum, learning appropriate social skills usually requires direct intervention. As a speech-language pathologist focused on working with children with ASD, I’ve used several different methods to help these young people learn how to interact with their peers and family, many of which are described on ASHA’s Practice Portal on Autism. The Bridgeway Academy, where I work, employs a variety of special education professionals, so we enjoy easy access to interprofessional collaboration. One interesting approach I use involves collaborating with a music therapist. We select students for this combined treatment because music motivates them or is a strength in their curriculum. Music can provide a structure for social language interactions and can help children with autism. It offers a powerful way to improve language skills and social-pragmatic skills through conversational lyrics, imitating body movements or language, cooperative play, and group activities/participation. We use music to target social language objectives, such as joint attention and eye gaze, in children with autism. Like conversation, musical activities require body awareness and understanding of nonverbal cues. Picture a conductor leading a musical ensemble using arm movements, eye gaze and body orientation to give performers direction without any verbal cues. Music therapist Alyssa Graber and I adapt these movements and gestures in our speech-language/music co-sessions to teach similar nonverbal cues to our students with ASD. These skills require students to orient their body to the person leading the activity and attend to that person for more than a few seconds. Students also must pay attention to the people around them to know when and how to play their instrument. We help students generalize these skills into various social situations. For example, we talk about what others may be thinking based on body language, including how close or far away you are from other people, ways you can show others you’re ready for a turn, and how you can miss your turn if you’re not looking. You don’t need musical training or fancy instruments for these activities—just some egg shakers, maracas, tambourines and a drum! We adapted our activities from Rhythmical Alchemy Drum Circle Games and Kalani Das Drum Circle YouTube videos. Orbit: Each student gets an instrument. Students take turns standing in the middle of the circle. When you’re in the middle, your objective is to use eye contact and body orientation/movement—turning toward someone and/or nodding—to let others know when to play. When the person in the middle looks at a student, they play. When the student in the middle turns to someone else, that student plays and the previous student stops playing. Performer and audience: Students take turns acting as the performer and part of the audience. We find students really enjoy performing both well-known songs and songs they make up on the spot. Drum circle: Students each get a drum or you can use one large drum. They take turns creating a rhythm and other students imitate it. Conductor: Students each get instruments. Students then take turns conducting the entire group. We usually start by discussing what we expect of the conductor and group, as well as reviewing what different hand and body movements mean. 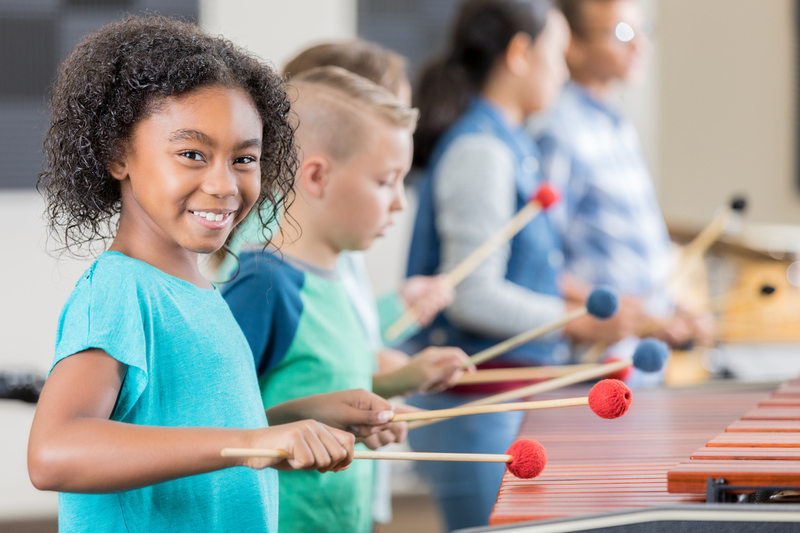 Students can move their hands fast or slowly to determine the tempo of the music and make large or small movements to indicate if the group should play loudly or softly. Let us know if you use any of these activities and how they worked for you in the comment section below. ANd please share anyactivities result in successful social skill acquisition for your students with autism?